She volunteers at a hunger relief agency, works at a hospital, and — oh, yeah, is competing on the world’s largest cooking competition reality show. The Dearborn, MI native uses her Arab background to inspire her culinary feats, while doubling as a social worker focused on women and children. 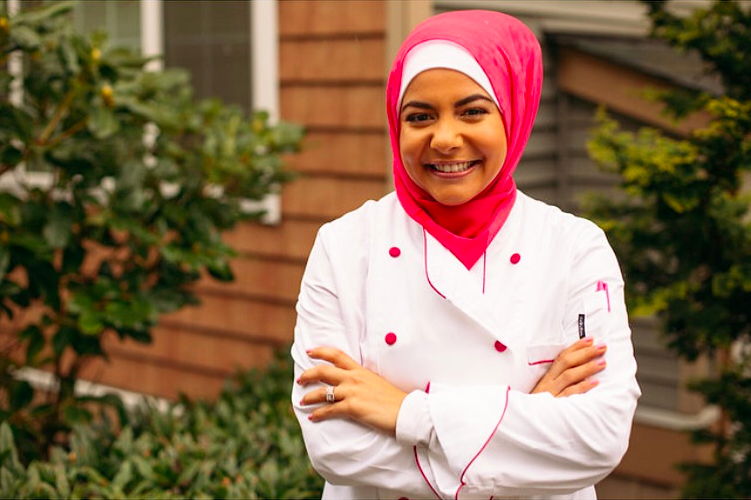 Now, her participation in this season’s MasterChef series makes Amanda Saab the first headscarf-wearing chef on American primetime television. Here, Amanda gives MuslimGirl an exclusive interview on her incredible accomplishments. A Muslim, a wife, a daughter, a sister, a friend, a social worker, a chef, and a citizen of the world! My husband and I were watching MasterChef together after work one evening. When the casting call information came across the screen, Hussein immediately said, “You have to do it.” We went online and the list of cities for the casting calls did not include Seattle. There was a casting call on October 18th in Los Angeles. It was to be held two days after our wedding anniversary. Hussein asked, “Anniversary gift?” and off we went. My mother, Hala, has encouraged me to pursue all of my dreams. She has always said to me “Amanda, you can do anything you put your mind to.” When I told her I was planning to audition for MasterChef, she was ecstatic! As with any profession, Muslim women wearing hijab can be faced with ignorance. In my experience, many stereotypes have been quickly dispelled as people get to know me. I believe my presence in the culinary world is breaking stereotypes that Muslim women are oppressed and cannot follow their passions. Here I am culinary world! I am free! My cooking is a representation of me — East meets West. I love American food and I also love Mediterranean food. I love blending the flavor profiles and putting my own twist on classics. You can never have too much garlic, right? Throughout the entire casting process, I have kept my faith in God’s plan for me. My prayers were, “God, if this is good for me, allow me to continue, and, if it is not, please protect me.” I think this was the only way for me to get through such a long process. The season premiere of MasterChef USA airs on FOX on May 20 at 8:00 PM. We deleted 5 spam messages. But I don’t think that she’s the first. If I can recall, there was an African American Muslimah on CutThroat Kitchen in either season 6 or 7. I’ve been trying to find it. Nevertheless, it’s great to see the sisters on Primetime. I agree with you, however the HUGE difference is Cutthroat Kitchen is a small show on a niche cable network; MasterChef is a HUGE show on a HUGELY mainstream TV channel airing at primetime. She isn’t the first! Amina El Shafel was on Masterchef Australia in 2012.